Original Season All is a mild seasoning that blends for everyday cooking with the taste of true cajun flavor. Quality ingredients means low sodium. 8% sodium, no msg. 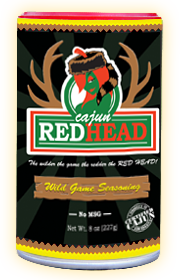 Cajun Redhead Wild Game is extra red and great as a rub, marinate or seasoning for wild game or extra flavor. Quality ingredients with a little more flavor. 10% sodium, no msg. New flavors that will fit your taste. Custom label Cajun Redhead seasoning! Put your company on our can, a winning combination. Get your name out there and gift your clients with something they will use time and time again. Turn-key from design to delivery. Contact us to get a cutom label quote. Cajun Redhead stayed true to the Cajun way of cooking but reduced the amount of sodium compared to the leading competitors. We did not take away from the flavor, we blended the perfect amount of spices in each of our seasonings. We created our Original Season All with only 8% sodium by adding lots of quality ingredients to create an original cajun seasoning. We wanted to create a unique spice and brand that everyone across the country would come to recognize and love. Most seasonings contain more than the daily allowance of sodium. We stay true to the Cajun way of cooking but reduce the amount of sodium compared to the leading competitors. We feel it's important to celebrate food. It is the one time where families, friends and colleagues take time to relax and gather, laugh and share life experiences..
A culinary graduate from Johnson and Wales University in 1998, cooked professionally for 10 years while developing an original true cajun flavor.
" 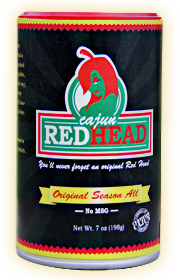 Looks like Browns Grocery will start carrying Cajun Red Head! Good Stuff on steaks!" " As we told you a few weeks ago the feature "Find Phil" in the Jambalaya News this week is giving away 6 cans and a Cajun Red Head T-shirt! " A blend of quality cajun ingredients for everyday cooking. Extra red! Perfect as a rub, marinate or seasoning. Look good and Support Cajun Redhead.